Tonight's Meteor Shower: Live, From Space, It's The Quadrantids : The Two-Way If you haven't heard of the Quadrantids, don't worry. Even NASA calls them "a little-known meteor shower named after an extinct constellation." But in the Northern Hemisphere, they can be well worth watching. The Quadrantid meteor shower is seen shortly after 5 a.m. on Jan 3, 2013. This year's shower will be helped by a new moon that will keep the night sky dark. 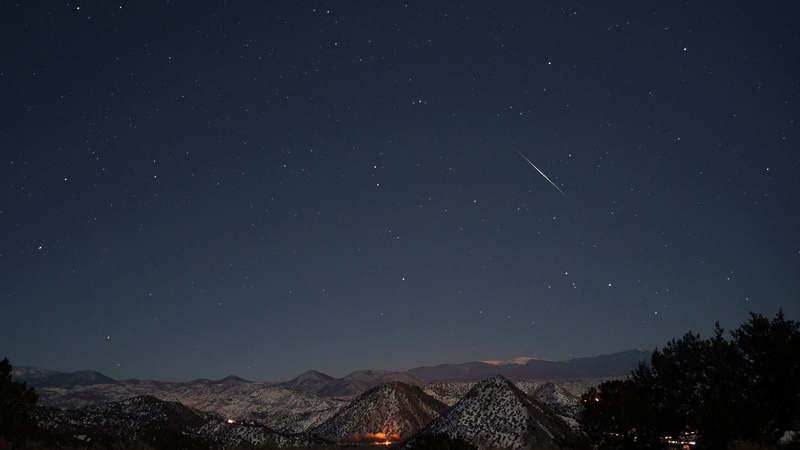 It's early January, and that means it's time for the Quadrantid meteor shower to peak. Despite winter weather that might cloud the skies in some areas, forecasters say this year's event is worth getting up for, citing lunar conditions that will darken the night sky. If you haven't heard of the Quadrantids, don't worry. Even NASA calls them "a little-known meteor shower named after an extinct constellation." The meteor shower's appearance was first recorded in 1825, NASA says. And the Quadrantids are also known for lasting only a few hours, meaning you'll need to see them now or wait 'til next year. If the sky over your location is too cloudy tonight, you can watch streaming video of the meteors in a feed NASA has set up from its Marshall Space Flight Center in Huntsville, Ala. The cameras were turned on at 6 p.m. ET; we're embedding that video below, with the caveat that we did not select the music. Visible in the Northern Hemisphere, the Quadrantids have "a maximum rate of about 80 per hour, varying between 60-200" in different years, the space agency says. This year could present a good chance to see the meteors, thanks to the Jan. 1 new moon that removes a large source of reflected light from the sky. Space.com notes that the Quadrantids' official peak won't come until Friday afternoon, meaning the sun is likely to keep skywatchers in the U.S. from seeing the shower at its best. But that's not dampening others' expectations. "If you're thinking of watching the Quadrantids, do it," the folks at EarthSky tell us. "Meteor shower peaks are rarely certain, and sometimes a gamble on a shower will reward you with a good show." The site adds, "No matter where you are in the Northern Hemisphere, the best time to watch is between midnight and dawn, local time." If you're looking at the right time, the Quadrantids should make their appearance near the tip of the handle of the Big Dipper and west of the bright star Arcturus. "In 1922, overcrowded constellation maps necessitated the removal of the 19th-century stellar figure Quadrans Muralis. Astronomers decided to assign its stars to the neighboring constellation Bootes, the Herdsman." "Like the Geminids, the Quadrantids originate from an asteroid, called 2003 EH1," NASA says. "After hundreds of years orbiting the sun, Quadrantids will enter our atmosphere at 90,000 mph, burning up 50 miles above Earth's surface — a fiery end to a long journey!"